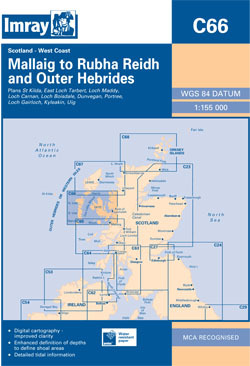 The west coast of Scotland from Mallaig to Rubha Reidh, Skye, and the Outer Hebrides from Barra to South Harris. Scale: 1 : 150.000. One-minute gridlines. Larger scale plans of St Kilda, East Loch Tarbert, Loch Maddy, Loch Carnan, Loch Boisdale, Dunvegan, Portree, Loch Gairloch, Kyleakin and Uig. 2016 EDITION - Fully updated throughout, includes the latest available survey data.